August 1, 2011 - Volantor is a film about Paul Moller, a modern day Wright Brother, who may revolutionize personal aviation forever when he pilots his M-400 Volantor "Skycar" for the first time and achieves a 70 year old childhood dream. Over the past century America has developed the strongest car culture in the world. We go everywhere by car, from the grocery store to the opposite coast. However, 55 years after the start of construction of the Eisenhower Interstate System the U.S. is hardly building any new roads. We have reached a saturation point, but traffic and vehicle ownership continues to grow up to 30% every ten years. Needless to say, we are approaching a bottleneck and we need some brilliant solutions soon. Dr. Paul Moller’s invention may be one of them. USC School of Cinematic Arts graduates Scott Hardie and Konstantin Brazhnik are currently in pre-production for a documentary film titled Volantor. The film will document the esteemed inventor Paul Moller and his 45 year long journey to bring his M-400 Volantor (deemed the “Skycar” by the press) to the market. Although faced with overwhelming criticism, today Paul’s invention is closer than ever to being commercially viable. His uncompromising ambition will guide the story as the film documents his upcoming test flight this October, 2011. The Moller Skycar is a prototype personal VTOL (vertical take-off and landing) aircraft — a "flying car" — called a "Volantor" by its inventor Paul Moller, who has been attempting to develop such vehicles for forty years. The design calls for four ducted fans encasing the propellers, which prevents bystanders from being exposed to moving blades as well as improving aerodynamic efficiency at low speeds. The craft said to be currently under development, the M400, is purported to ultimately transport four people; single-seat up to six-seat variations are also planned. It is described as a car since it is aimed at being a popular means of transport for anyone who can drive, incorporating automated flight controls. It is proposed that in a model for the general public, the driver may only input direction and speed. Further, developers claim that by using eight inexpensive Wankel rotary engines - compared to jet engines, the vehicle's price may eventually fall close to that of a luxury car ($100,000). The fuel consumption is claimed to be 20 miles per gallon — similar to that of a big car— but this has been calculated as unrealistic. According to the developers, operation of a Skycar will produce as much noise as traffic on a nearby freeway when taking off. The Skycar demonstrated limited tethered flight capability in 2003 by hovering only. Scheduled tethered flight tests, which were to occur in mid-2006, were apparently canceled. Moller upgraded the Skycar's engines in 2007, and the improved prototype is now called the "M400X". According to a 2008 article in the media, a prototype is supposed to be flying in 2012, with certified versions "a few years later". Moller reports that a public test flight is scheduled for October 11, 2011 in Vacaville, CA. Moller International claims that $100 Million has been spent in R & D.
Will he succeed in achieving his childhood dream or is the public just not ready for another Wright Brother? “I believe that this is our opportunity to document one of the great inventors of our time and by taking a ride on his dream, we may all be motivated to pursue our own.” -Scott Hardie, Director. The filmmakers are currently seeking donations from fans and enthusiasts to fund the start of production through www.Indiegogo.com/Volantor and are fiscally sponsored by Fractured Atlas. 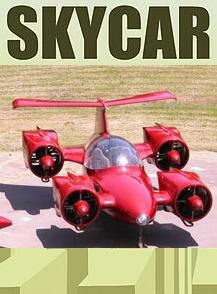 Incentives for donations range from signed memorabilia to a VIP tour of Moller International to see the Skycar in person! For more information visit www.Volantorfilm.com.